1922 Caterpillar ad found on eBay, here. 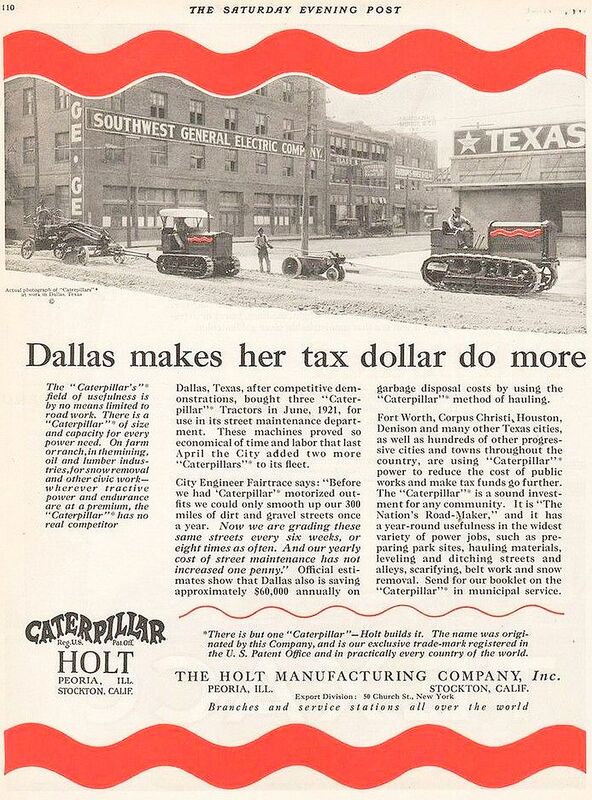 I find it interesting that originally “Caterpillar” was a trademark of the Holt Mfg. Co. Of course, some time between then and now they changed the name of the company to “Caterpillar”. My former employer was a supplier to Caterpillar in Peoria. I wonder if Cat were the originators of the commercial tracked earthmoving vehicle, or just one of several. I guess the basic technology was taken from the WWI tanks. Yes, I did a little looking and I see the tracked vehicle design originated around 1904, apparently with Holt. The wikipedia entry for “Holt tractors” is quite brief, but it does state that the first major use of the firm’s tracked prime movers was in the construction of the Los Angeles Aqueduct in the years 1908 to 1913.